Yamaha Fifty112 solid-state guitar amp. Works and sounds great. 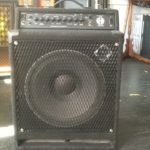 SWR WORKINGMANS 15 Bass AMP.